time took itself to sloth from one point to the next, which was back in August when lunch between mother and daughter was a three-hour affair that would take place under impromptu patches of flowery shade over crostinis and blueberry compote. but then, like a child, it grew as an exponential function. So here we are, in the very belly of November, and every man I see sports some sort of awkward hybrid between grubble and moustache on their face. In all honesty, the only possible thing I can connect that – whatever that is, movember? – to would be that stage when a cute fuzzy baby chicken overnight becomes this grotesque, almost reptilian creature with non-uniform spikes protruding from their pores. But for the cause behind the hairiness I think I can go another two weeks. Afterall, two weeks feels to me like three days now. And eggplants are running exponentially faster away from me. My mind, however, still dreams in purple – the deep, royal, amethyst sort of purple. Best friend, math has not done so much to take away my imagination. I can still dream up a thousand and one ways to cook a deep, royal, amethyst purple giant of an egg. Here’s 1/1001 of the ways. and the French love the name? To make the candied eggplant, preheat the oven to 415 degrees F with the rack placed in the middle of the oven. Line a baking sheet with foil and brush it with some mild vegetable oil such as grape seed or avocado. 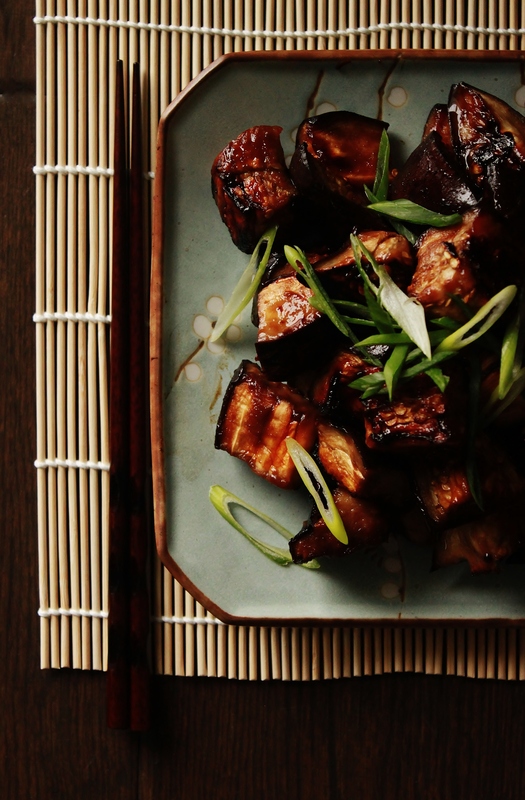 Stir together the miso, honey, rice vinegar, and sesame oil. Toss the diced eggplant in the miso glaze to coat evenly and spread the eggplant onto the prepared baking sheet. Bake for 25~30 minutes, or until the eggplant becomes caramelized and very tender. Transfer to a plate and garnish with the sliced green onions, and a thin drizzle of sesame oil, if desired. This might just be our favorite new recipe. I made it for dinner last night and added maitake mushrooms to the roasting pan, served with rice and topped with a bit of cilantro. So good! That’s awesome! Thank you, and I’m glad you loved it!